The El Vaporo E Liquid comes from Canada so you can discover beautiful audacious recipes which you will benefit with unique flavours. Conditioned in a 50ml bottle, with a rate of 50/50 PG/VG. The El Vaporo E Liquid offers the gourmet flavours you are searching for. The El Vaporo E Liquid is ideally produced for vapers in search of high quality e liquids. Good Tasting! The El Vaporo E Liquid proposes an excellent Classic accompanied with the Graham perfume! 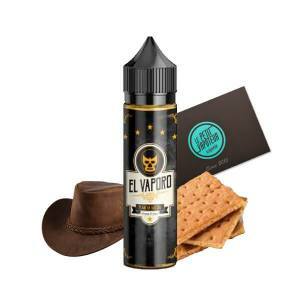 El Vaporo E Liquid offers you the perfect accord between and Hazelnut Cream and Banana ! El Vaporo propose you to taste a beautiful taste of Cinnamon with a hint of sugar! The El Vaporo is proposed by the Canadians, lovers of vape. Each E Liquid offers beautiful gourmet flavours, unique in their own kind. You can find the Plancha Suicida with flavours of Graham biscuit and excellent Classic, the Guillotina, a perfect mixture of Banana and Hazelnut Cream or even the El Vapotero Centon Bomb offering a perfect alliance of Cinnamon and Sugar. Each El Vaporo E Liquid is avaiable in a 50ml bottle without Nicotine. You can associate one or more Nicotine Boosters depending on your convenience.